It is with hesitant fingers I type this blog today. A lot of things have happened from my last blog and I have spent a lot of time offline trying to comprehend how I fit into the creative world and trying to gather confidence to join in without feeling anxious. I had started to enjoy discovering layers of creativity that I didn’t know I had and find different areas to express myself, despite my mind being a bit more complex to understand. My previous blog covered some personal issues which are ongoing and possibly have added to how I am coping right now. Over the last weeks when I wakened each morning, I listened as one little bird started to sing. Instead of my mind starting to think that I have 101 things to do or set full force into a nervous cyclone. I became aware that hurtling through a fast paced social media wasn’t the same as I had experienced in the past. I realised the pressures added to my health issues and this was something that I couldn’t brush aside or decide I wouldn’t open an app until I had come to terms with social sharing with hidden depths. Our health and well being isn’t something we can open and close like an app. and it’s effects have impact on our families too. I have wandered from my initial thoughts and I need to bring this back to the little bird singing. The first notes, he was alone, the other birds had not yet joined the chorus. His soft refrain was the wake up call, albeit to pronounce his territory or attract a mate. My bird was singing to welcome a new day, giving thanks for his little life. Morning was breaking, the volume of the chorus started to rise as each bird took their turn in joining the first bird who wakened before the dawn. The song was harmonious, a magnificent choir. Every type of bird have their traits. Some more territorial, some more congregational yet the notes joined to form a magnificent choir. A day started with prayer and listening to the birds is time set aside to feel a pool of tranquility wash over my mind. Thankful for a new day, a day we can share and reach out with a hand of friendship and support for those who we have respected with their talents and for friends we have made across the world. Despite my shyness to be part of real life meetings, I used to have one less hurdle to face when I met friends online. Friendships will be there when they are genuine and as my one little bird started my day, he sings in the evening to help bring me back to the start of a new day. I had finished my knitting projects. 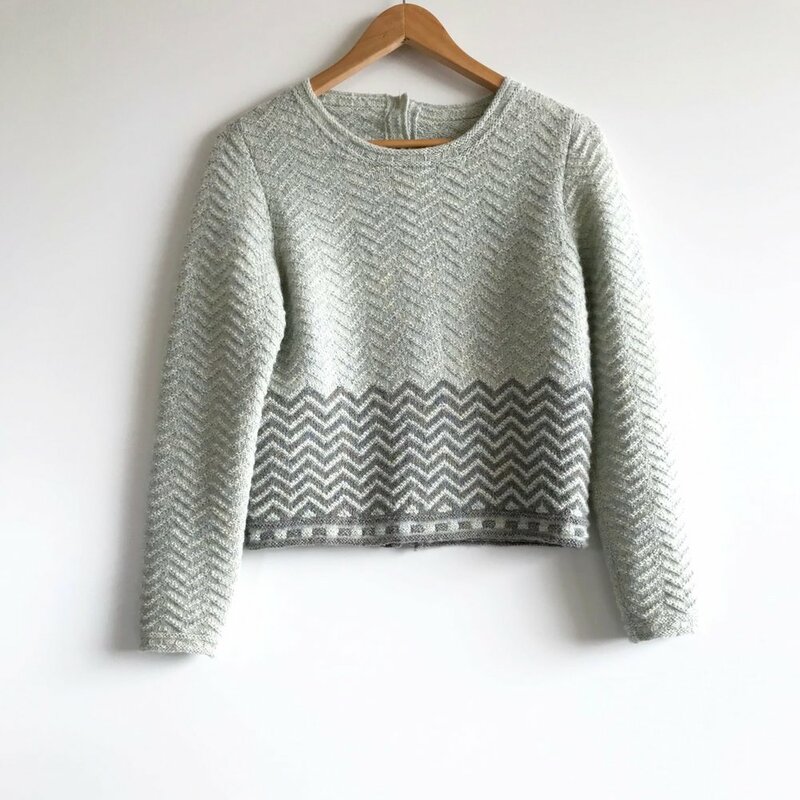 Dad’s sweater (he only takes it off to go to bed) Balmaha II by Kate Davies. I love this design and the colours I chose for this version have really shown me how much I learned about colours while knitting the Dathan projects. I haven’t worn it as a day to day sweater, until I will allow dad to take some photos of me wearing it (dad doesn’t think like this he just wears his sweater!) I still have Dathan II to take photos off. I actually could knit another Balmaha, that’s how much I love this yoke. The photos below bring my unfinished photos from my last blog to finished but still to be worn for this blog. I had time aside without anything on my needles and struggled with how I felt and what would I knit next as my confidence had taken wings. If only I could be back in the days when I didn’t know Ravelry had activity feeds and Instagram was just for the joy of sharing with added fun of friends who knit and those who didn’t. I really couldn’t cope but little did I realise I had some threads of hope. Threads of strength and threads so fine as all of us have vulnerabilities and need support from time to time. I love to care despite my obvious weakness. I don’t perform well in public or social standings but no matter what all of us need care as there is enough to divide our world today. After I had faced an appointment last week I needed something to keep me going along the creative path for the next few months. My mind wasn’t where it should be but I knew I depended on knitting to help me with so many things. I had a sock book by Hunter Hammersen ‘Silk Road socks’ but hadn’t knit from it. Oh dear, with a scrambled mind my first attempt to knit a sock from the book wasn’t a good place to start! The book is lovely but the basics of sock knitting are needed as some of the details were missing to me as I hadn’t knit socks without detailed instructions. I don’t want to take add a lot more about this but suffice to say when I had gone back to look at a vanilla sock I was able to work out the abbreviations and construction and knit my first pair from this book. I made another mistake as I just knit the first size, not realising the standard would be 64sts and mine was 54. I thought all would be lost and they would fit a child but I would learn the construction. Surprise and delight the socks are the best fitting socks I have knit to date! I knit the second one with more knowledge and have started another pair from the book for times when I just can’t knit a larger item. I wasn’t too keen on my sock wool with super wash although I will wear them as a test for the fit and to see the pretty lace design. My next pair feel better with non-superwash wool. I will possibly knit more from the book now I have more understanding. Today I am adding a new main project to my blog as working with threads/yarn of this nature reminded me how friendships bind together. The wisp of mohair with the strength of cotton/linen lends to a garment with more structure than knit with a wisp alone. The wisp is fragile, the same way some of us feel and I know I am the wisp of mohair with a little added silk from friends who have encouraged me to feel stronger no matter what I have to face soon. The cotton and linen are the added continual strength, not easily broken. This brought me back to friendships who remain no matter how different we are with opinions and beliefs. Knitting this in combination with the mohair and silk brings friendships closer with the ties that bind. I have knit some of Helga Isager’s patterns before and part of me feared the more sketchy patterns, the bits that were lost in translation which made me worry about her new book Stitches but dad really wanted me to have a special gift which added a new twist to my knitting. The format of this book is excellent, the colours of the pages, the way it lies flat all adds to the joy of knitting with different textures and type or yarn. I have longed to knit a mohair with another yarn for a long time but was never confident enough to know how much I needed or if it changed my gauge completely. There are several patterns in the book which I have bookmarked to knit but the one I chose is the Hazy jacket. Pantone colour of the year - living coral - bright enough and engaging. I was first attracted to the Cloudy blouse (which I still love and hope to knit) but it uses one strand of Spinni which I have knit with before. My mind needed the wisp of softness and the reassurance that I could complete the embroidery which looked more complex for some of the other designs. First photo the yarn I will be using. Second photo my WIP with swatch to test the embroidery. I love how the design works the lower back panel with a stitch difference to keep the back sitting correctly. I have a lot of ‘at the same’ time increases ad decreases marked down as I do not trust my mind at the moment. So far the pattern has been simple but it needs to be read before starting as true to Isager’s form things happen ‘at the same time’ I just hope when I divide to knit the sides and back separately I will understand the shaping instructions. It is a challenge for me at this stage as I know my mind isn’t working on full par but the knitting gives me permission to stay offline so I don’t read things that cause me to cry. The patterns will take me through the seasons with spring, summer and winter knits but I will not be forgetting to keep a project from KDD and then start the club knitting as autumn approaches with new patterns to inspire and encourage me to feel more confident joining in and sharing my knitting. Knitting mohair together with the Bomulin isn’t as awful as i thought it may be. The fabric is soft and so light, both yarns work together without splitting. I will have to be careful with the embroidery as the Bomulin is stranded and needs to be stitched with care. I would love this to wear with a few jumpsuits I have for summer but with the embroidery I am not sure how long that will take. I will take my time with this bit and by then I hope to have another knitting project on my needles and be watching with anticipation for knitting season to resume at some stage to fire up my creativity and bring me into the community with more confidence.